Housed in one of the most spectacular organ cases in the world, the colourful 1738 Christian Müller organ of St Bavo in the Dutch city of Haarlem is the perfect instrument for this all-German programme featuring works by Bach, Buxtehude and Mendelssohn alongside Julius Reubke's Sonata on the 94th Psalm. Abbreviations and acronyms obsess modern life. But they’re nothing new. The choral societies and concert rooms of Victorian and Edwardian England didn’t have their ‘Tchaiks’ or ‘Rachs’—but they had ‘The Three Bs’, a tag, coined by the German Peter Cornelius in 1854, referring to Bach, Beethoven and Berlioz. Appropriating it, von Bülow hallowed the ‘Holy Trinity’ dimension with which many are still familar: ‘Bach, the Father, Beethoven, the Son, Brahms, the Holy Ghost’. Quartet players, naturally enough, assume another primacy: Beethoven, Brahms, Bartók. Organists similarly: Buxtehude, Bach, Bruckner. Buxtehude of Lübeck was the man who, in 1705, the young Bach walked nearly five-hundred kilometers to hear. His contemporaries and successors thought of him principally as an instrumental composer, the defining voice of the 17th-century German organ, Quantz in 1752 ranking him among those early Northern Europeans working ‘on the improvement of musical taste [who] wrote almost as the first the most tasteful pieces of their time’. His sizeable vocal catalogue coincided with the rise of the Protestant ecclesiastical cantata, but it wasn’t until the early 20th century that its importance began to be properly recognized. In 1951 the first edition of The Record Guide (Sackville-West, Shawe-Taylor) acknowledged ‘his organ works and church cantatas [to] show a passionate and brooding imagination of a highly individual order’, an opinion consolidated and expanded in the decades since. By way of footnote, the Russian Romantics admired and championed his ‘freshness’—Taneyev, Glazunov, Esipova, Prokofiev (the latter transcribing the D minor Prelude and Fugue BuxWV140 for piano, programming it in Chicago in 1922). Undated, the Toccata in F, BuxWV157, is exultant and extrovert—an improvisatory prelude, contrasting running ‘Italian’ semiquavers and ‘French’ dotted-rhythms, preceeding a rigorous four-part fugue. To 19th-century middle-Europe Bach was the Parnassus, the ‘pictorial musician-poet’, of the age. Worshipped by Beethoven (1801)—‘first father of harmony’. Monumentalized by Weber (1821)—‘a Gothic cathedral dedicated to the arts’. Deified by Schumann (1840)—‘unapproachable, unfathomable’. The Bach Awakening was a peculiarly German/Anglo-Saxon affair. It elevated one man’s genius. It gave the Baroque Romantic pertinence. It made History acceptable to programme. Sailing by the flag of German fugue, Mendelssohn the conductor, Liszt the pianist, led the way, promulgating Bachian aesthetic for the common good. Spanning his life, Bach’s keyboard output was copious. Music for private, public or pedagogical use, universally destined if at the outset confined to the locale of his appointments—for ‘Bach and his fellow organists and cantors belonged to a closed society [not to the 'larger world' of the 'great centres of Europe']. His reputation as an organist was widespread, but it was a provincial fame, far removed from the European reputation that Handel enjoyed’ (Max Graf, Composer and Critic, 1947). Jesus Christus, unser Heiland, BWV688, comes from the Clavier-Übung Part III, the so-called German Organ Mass, published at Bach’s expense in September 1739. ‘Various preludes on the Catechism and other hymns for the organ,’ read the title page. ‘Prepared for music-lovers and particularly for connoisseurs of such work, for the recreation of the spirit, by Johann Sebastian Bach, Royal Polish and Electoral Saxon Court Composer, Capellmeister and director of the chorus musicus, Leipzig.’ Bach’s trio setting—complex and elaborately motivic, the two manuals concerned largely with fleet invenzione and imitative writing (Dupré used to fancy it as a scherzo, registering appropriately)—references Luther’s Eucharist hymn of the same title (1524), the deliberated D minor canto fermo melody (1529) fragmentized on pedals. ‘Christ Jesus, our Redeemer born,/ Who from us did God’s anger turn,/ Through His sufferings sore and main,/ Did help us all out of hell-pain’ (Charles Sanford Terry, 1921). In keeping with his predecessors, contemporaries and successors—Beethoven, Spohr, Weber, Schumann, Brahms, Bruch, Reger—Mendelssohn, pianist and organist, master of the majestic and the modest, married Classicism and Romanticism, in the process ‘single-handedly [averting] the history of organ literature from a course of utter decadence’ (Eugene Murray Gates, McMaster University 1985). Compiled from twenty-four pieces or ‘studies’ written between 1844 and 1845, plus an earlier fugue (1839), the Op 65 cycle, ‘Six Grand Sonatas’, conceived originally as a sequence of voluntaries, was commissioned by Coventry & Hollier of 71 Dean Street, London—according to their ‘Mendelssohn’s Organ School’ advertisement in The Musical World, 24 July 1845, expressly ‘to bring forward immediately […] specimens of what the Composer himself considers his own peculiar style of performance on the Organ’. Dispensing with the customary sales-pitch of the day—‘any eulogium would be quite superfluous relative to a Composer so universally esteemed as Mendelssohn’—Charles Coventry, friend and Bachian, delighted to have signed such a starry Victorian idol, paid £60 for the privilege, selling the collection to 192 subscribers at a guinea a copy. Those who subscribed included William Sterndale Bennett of the Royal Academy of Music, John Goss, Organist of St Paul’s Cathedral, and, waiting in the wings, an otherwise unknown eighteen-year-old eking out chapel experience in Liverpool, W T Best—the ‘greatest English organist of the second half of the 19th century’ (William A Little). Mendelssohn dedicated the collection to a Frankfurt lawyer, Dr Fritz Schlemmer. It ‘originated little by little,’ Schlemmer told the Brighton organist F H Sawyer years later. ‘I had no idea that such a long work would appear when he [Mendelssohn] surprised me with a copy of it. He carried [these pieces] 'in his head' for many years, especially toward the end of the thirties and the beginning of the forties, and then wrote them down […] Chorales were introduced because of his love for J S Bach’s works, especially the chorale preludes, and the treatment of […] chorales in the church cantatas. The sonatas were not extemporizations […] subsequently written down; [they] are well thought-out works’ (letter, 28 March 1884). Schumann, mentally prostrate in Dresden, Clara on hand, waxed lyrical. ‘Only the other day we became quite absorbed in your organ sonatas, unfortunately only at the [?pedal] piano, but even without the title page we would have known they were by you. And yet you are always striving to advance still more, and for this reason you will ever be an example to me. These intensely poetical new ideas—what a perfect picture they form in every sonata! In Bach’s music I always imagine him sitting at the organ, but in yours I rather think of St Cecilia touching the keys […] Nos 5 and 6 seem to me splendid. It is really a fact, dear Mendelssohn, no one else writes such fine harmonies; and they keep getting purer and more inspired’ (22 October 1845). Last of the set, the D minor is in three movements—a Chorale and Variations (Chorale Partita) and closing andante Finale in the major framing a central Fugue (the only dated section, 27 January 1845). Like briefer treatments by Buxtehude and Bach, much of the work draws on the Lutheran hymn Vater unser im Himmelreich (1538), the ‘Old 112th’, a paraphrase on the Lord’s Prayer (‘briefly expounded and turned into metre’) set to an anonymous earlier tune. ‘Our Father in the heaven Who art,/ Who tellest all of us in heart/ Brothers to be, and on Thee call,/ And wilt have prayer from us all,/ Grant that the mouth not only pray,/ From deepest heart oh help its way’ (George MacDonald/Terry, 1921). Mendelssohn uses this chorale, gravely four-square in block harmonies (2/2), to book-end the first movement, in between writing four variations or ‘divisions’ of contrasted character and metre. In the first of these (Andante sostenuto, 4/4) the canto is heard in the soprano, decorated with semiquavers; in the second (12/8) it’s presented chordally against demanding pedal triplets; in the third (4/4) it’s allocated to the tenor voice in the lower manual, against a double-note right-hand counterpoint; in the fourth (Allegro molto, 2/2), a brilliant figurational display of typically/pianistically Mendelssohnian character, it’s transferred to the pedals. Leading on without a break, the subject of the four-part Fugue (Sostenuto e legato, forte 3/4, ‘tonally’ answered) is derived from the opening clause of the tune. Incense and farewell, appeasing the spirit, the 6/8 Finale is in the style of a melodically independent pastorale/voluntary, ‘Sei stille dem Herrn’ (Oh rest in the Lord) from Elijah (1846) within calling distance. Consumption, ‘the weariness, the fever and the fret’ (Keats)—tuberculosis—was the scourge of the Romantics. As many as 90% of urban Europeans carried the disease. It stole young geniuses from life, it left hearts bereft and great men sorrowing. Come mid-century, Chopin’s Carl Filtsch (days short of his fifteenth birthday), who promised the yet-to-be attained, and Liszt’s Julius Reubke (twenty-four), who for a breath of time gazed upon the gigantic, were gone before they’d arrived. Son of an organ builder, Reubke studied piano and composition with Kullak, Stern and Marx (among others) at the Berliner Musikschule, attracting von Bülow’s notice. In 1856—Bach, Beethoven’s sonatas, and Mendelssohn’s for organ at the core of his repertory—he went to Weimar, becoming Liszt’s favourite pupil and living at the Altenburg, Carolyne von Sayn-Wittgenstein’s villa. He gave the first performance of the Sonata on the 94th Psalm, inscribed to the conductor Carl Riedel, in Merseburg Cathedral on 17 June 1857—playing the then largest organ in Germany (by Ladegast, formerly apprenticed to Cavaillé-Coll). ‘A wealth of imagination and great freshness of invention,’ reported Karl Brendel in the Neue Zeitschrift für Musik. Towering among the pinnacles of middle-European organ writing from Bach to Reger, combining intellect and instinct with virtuosic physical/pianistic demand, the 94th looks to Lisztian programming and structural liberation for its organisation. In 1856-57 Reubke was intimate, theoretically and practically, with Liszt’s symphonic poems, the B minor Piano Sonata, and the Fantasy and Fugue on Ad nos, ad salutarem undam (the revised version of which had been premiered at the Merseburg organ dedication in 1855); no doubt, too, the 'Faust' Symphony, then in its final stages of completion. Advanced in Neues Deutsch aesthetic, vocabulary, texture/enmeshing, motivic working-out and rhythmic cross referencing, the 530-bar C minor whole is linked cylically (at times metamorphically) by a fourteen-note motto idea heard at the outset on pedals, the descending scale shape of which incorporates nine steps of the chromatic octave. Architecturally, it’s divided into chapters of different content and tempo (thirteen in all), the exact labelling or function of which, nevertheless, is open to interpretation. Introduction-Allegro (Fantasia)-Adagio-Finale (Fugue) is a nominal definition but one inclined to over-simplify the drama. A continuum of columns and climaxes, a tensioned series of multi-dimensional compressions, extensions and formal superimpositions in the spirit of the Liszt Sonata, more distantly/intuitively perhaps Beethoven’s 'Eroica' finale or Grosse Fuge, may be more pertinent. Choonhae Kim Lee (University of North Texas 1989) proposes an interestingly layered one-movement/ multiple movement/’double structure’/ sonata-fugue-rondo complex. (a) Sonata: ‘Exposition’/’1st movement’ (Grave-Larghetto-Allegro con fuoco); ‘Development’/’2nd movement’ (Adagio); ‘Recapitulation-Coda’/’3rd movement’ (Lento-Allegro-Più mosso-Allegro assai). (b) ‘1st movement’ sub-design (sonata): introduction (Grave)-exposition (Larghetto)-development-recapitulation [temporally metamorphosised] (Allegro con fuoco)-coda (Grave). c) ‘2nd movement’ sub-design: A-B-A (Adagio)-transition (Lento). (d) ‘3rd movement’ sub-design (fugue/sonata, subject based on the motto): Fugue I: exposition, episode, free fantasy/ Sonata: exposition, development (Allegro)-Fugue II: exposition, episode, free fantasy/Sonata: recapitulation (Più mosso)-Coda (Allegro assai). (e) Rondo: A (Grave)-B (Larghetto)-A1-B1-A2 (Allegro con fuoco)-C (Adagio)-A (Lento)-A3-D (Allegro)-A4 (Più mosso)-Coda (Allegro assai). Otto Reubke, the composer’s youngest brother, oversaw the first edition, published by Schuberth of Leipzig in August 1871 (Der 94ste Psalm—Sonate). Drawing, it’s presumed, on the programme hand-out of the first performance (since lost), he prefaced the score with nine verses from the psalm, but with their descriptive place in the music left unspecified. ‘O LORD God, to whom vengeance belongeth, shew thyself./ Lift up thyself, thou judge of the earth: render a reward to the proud’ [vv 1, 2: associated traditionally with the opening Grave-Larghetto]. ‘LORD, how long shall the wicked triumph?/ They slay the widow and the stranger, and murder the fatherless./ Yet they say, The LORD shall not see, neither shall the God of Jacob regard it’ [vv 3, 6-7: Allegro con fuoco]. ‘Unless the LORD had been my help, my soul had almost dwelt in silence./ In the multitude of my thoughts within me thy comforts delight my soul’ [vv 17, 19: Adagio-Lento]. ‘But the LORD is my defence; and my God is the rock of my refuge./ And he shall bring upon them their own iniquity, and shall cut them off in their own wickedness’ [vv 22-23: the closing fugue, Allegro-Più mosso-Allegro assai] (King’s James version, 1611). 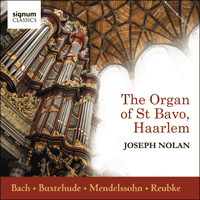 I am so thrilled that my tenth album for Signum has coincided with the remarkable organ and building of St Bavo, in the Dutch city of Haarlem. The Church and the history of its 1738 Christian Müller organ is very well documented, with composers such as Mozart, Handel and Mendelssohn all having played the instrument. 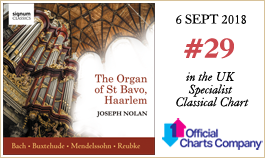 I cannot add anything germane that is not easily discovered online regarding the organ of St Bavo, however, I would like to provide a brief insight into the composition of the repertoire for this album. It is well known that the organ case of St Bavo is perhaps the most photographed in the world and with good reason. However, no photograph can prepare you for the shock of the grandeur of the case as you enter the Church and turn the corner into the nave. The scale of the case seems bigger and more imposing than you could imagine in a photograph and its sheer magnificence is breathtaking. Given the renowned clarity of the pipework and voicing of the organ, I began to ruminate upon if the Reubke Sonata on the 94th Psalm had been formally recorded on disc at St Bavo. Though the work was written in 1857 for the Ladegast organ in Merseburg Cathedral, with the changes and enlargements made to the organ of St Bavo, coupled with the clarity and style of voicing, this seemed to be an exciting new possibility. We have been unable to unearth a recording of the Reubke (on a professional label) and so it was decided to build a programme around this masterpiece. A few compromises had to be found as occasionally the compass of the organ did not provide enough notes and as St Bavo does not enjoy a Barker lever system to help with the weight of the action, playing with the keyboards coupled together (in the Reubke) provided quite a challenge in terms of weight of the keys! The acoustic of St Bavo is also perilously lively, and tempi had to be very carefully judged to balance clarity against drama. Having settled on this masterwork it seemed to make sense to me keep the entire programme Germanic, with the Bach Chaconne in D minor (arranged by the French organist Messerer) an excellent vehicle to display the many colours of St Bavo. More traditional stop combinations are provided for in Bach’s Nun komm, der Heiden Heiland, BWV659, and the wonderful trio, Jesus Christus, unser Heiland, BWV688. Buxtehude’s organ works (Danish/German) are eminently suitable to this organ and his Toccata and Fugue in F major, BuxWV157, is a splendid, and compact, example. It seemed very fitting to include what many critics consider Mendelssohn’s finest masterpiece for the organ, his Sonata No 6 in D minor. These variations, based on the Lutheran Chorale Vater unser im Himmelreich, BWV416, require an organ with stops of great beauty and balance, but with clarity, depth and magnificence when required. The organ of St Bavo is a marvel set in one of the prettiest small cities in Europe. It was a privilege to be permitted to record on this instrument and my most grateful thanks are extended to the generous custodian of the organ, Mr Anton Pauw.